Mort Kunstler Handsigned & Numbered Limited Edition Print :"Rendezvous with Destiny"
One of the greatest American heroes to emerge from the battle of Gettysburg was General John Buford. On the morning of June 30th - the day before the battle began - Buford led two brigades of cavalry from the Army of the Potomac into Gettysburg, supported by six pieces of artillery. Cavalry provided intelligence for the armies of the Civil War, and Buford was at Gettysburg in search of General Robert E. Lee's Army of Northern Virginia. He learned from the town's frightened citizens that the Confederates had been sighted to the west and north of the town. Realizing the Southern army was nearby, Buford rushed his cavalry through Gettysburg to set up defensive positions on the ridges west of town. He knew if his cavalry could slow down Lee's advancing troops, the Federal army had a chance to hold the best high ground and win the coming battle. Thanks to him, that's what happened. Buford led his horse soldiers by the Adams County Courthouse in Gettysburg, and positioned his artillery on Seminary Ridge. Apparently no one has ever painted the courthouse in this setting. It's a handsome, distinctive Civil War era building that has been beautifully restored - and I felt it was the perfect setting for this painting of Buford - Rendezvous with Destiny. 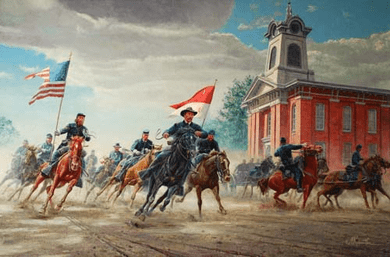 I love the excitement in this painting - all the action, the bright sunlit morning, the horses and military tack and General John Buford. It had rained in the early morning, which gave me the opportunity to paint an interesting, clearing sky radiating sunlight. The dark clouds at the top of the painting, based on weather reports of the day, lend much more drama to the scene than a blue sky. I placed the white portion of the cavalry guidon directly behind Buford's black hat - the darkest dark against the lightest light - which draws the viewer to the center of interest. I was also able to use the brightest color, the red portion of the guidon, to attract attention to General Buford as the painting's center of interest. In a painting like this one, the action has to appear authentic - not just the faces, the weapons and equipment - all of which have been thoroughly researched and carefully depicted - but the feel of the moment has to be genuine. To achieve that, I had to paint the horses in the midst of urgent movement. Thankfully, I've studied and painted horses for decades, so I was able to apply that experience and knowledge to this scene - and I believe it works very well. I hope the viewer who studies this painting agrees - and is reminded of American heroes like John Buford and the countless others from the North and South who demonstrated such remarkable valor at Gettysburg. About the Artist: Born in 1931, Mort K�nstler studied art at Brooklyn College, UCLA, and the Pratt Institute. After he left school, he became a successful illustrator in New York, freelancing for book and magazine publishers, culminating in a long-term affiliation with National Geographic Magazine. It was through their assignments of historical subjects that K�nstler learned the value of intensive research and collaboration with historians, leading to a well-earned reputation for accuracy and detail. No other artist has ever recorded so many events in the history of America, and certainly no one has done them with such extraordinary authenticity and drama as Mort K�nstler. From the Revolutionary War and Western or Native American subjects to his current recognition as the premier artist of the Civil War, he is considered America's reigning dean of historical artists. No thank you, I just want the print (as shown).